My poster advertising the pre-performance talks. 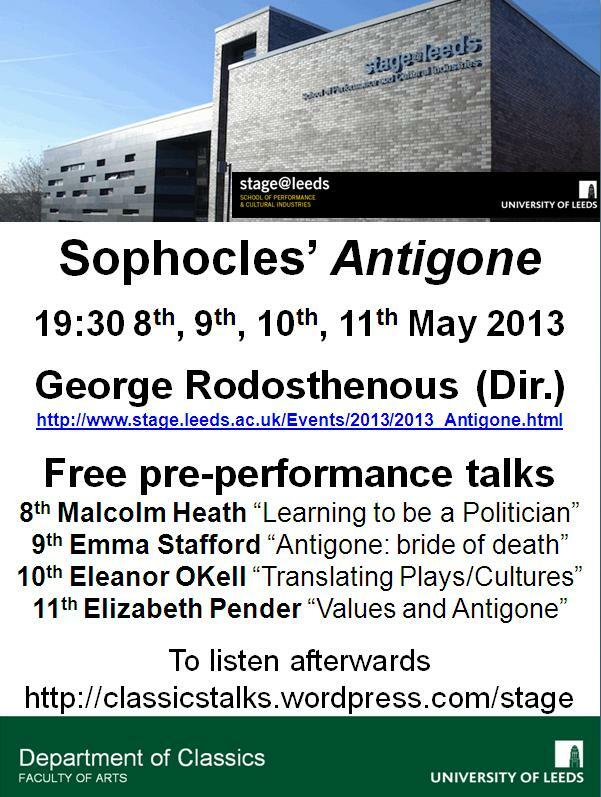 Leeds Classicists have been invited to contribute a series of pre-performance talks linking the original text/performance of Sophocles’ tragedy Antigone to the updated version being performed by Performance and Cultural Industries students at the University of Leeds in May 2013. Talks will not include spoilers and are designed to provide information and identify issues which will enrich the audience’s experience of the performance. Talks are free of charge and will take place before performances, lasting 20 minutes. Talks will start promptly at 19:00, to enable audience members to claim their seats in time for “curtain up” at 19:30. Please arrive a few minutes early in order to get to the talk venue. Talks will be published on this site afterwards.For previous pre-performance talks see the Stage page.